uicy, crisp, clean and invigorating, this American Fruit Beer pours a brilliant golden hue as bright as the summer sun. 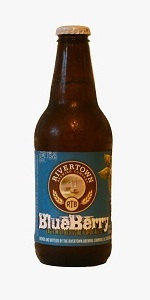 With a sweet, malt-tinged, fruity aroma, our Blueberry Lager strikes a refreshing balance between its American 2 Row malt base and vivid Blueberry flavor resulting in a beer that is the perfect pour for the long, lazy, hazy days of Summer. This one comes off as a little too artificial for me. It is a good beer but lacks complexity and body. I'm glad I was able to try it. Blueberry flavoring but not a whole lot else. Immediately after opening the bottle I get a whiff of something that reminds me of Boo-Berry cereal. Once poured you get a hazy golden straw colored body. Head stands at an inch and a half of off white small crackling bubbles. Nose is juicy and fruity almost like blueberry gum, kind of synthetic. Flavor is short and hollow. It lacks fruit and has only a creamy hint of wheat. I was shocked it didn't even live up to the nose. This one really needs retooled if it is to go forward.